Home renovations can prove to be a worthy investment for many homeowners, delivering quality and convenience on a daily level. You can achieve amazing results, especially if the best services are used throughout your home remodel. One eco-friendly option that can save you time and money is kitchen cabinet refacing. This service consists of giving your existing cabinets a facelift, refreshing the front surfaces while keeping other components intact. Homes with quality boxes and doors installed can benefit from our cabinet refacing services in Dunwoody, Atlanta, and beyond. Detail Design & Remodeling is here to serve as your home remodeling contractors for any and all of your renovation projects. We are more than happy to provide the best results with services such as cabinet refacing, but it’s important for you to remember that there are limitations before you get to work. Today, we’ll discuss a few limitations that can impact the results of your cabinet refinishing. If you’re ready for long-lasting quality and beautiful results that are built for daily enjoyment, be sure to contact our team today! While our cabinet resurfacing services are tailored to be the best in Georgia, keep in mind that there are certain limitations. Homeowners excited about the longevity and versatility of kitchen cabinet refacing may be disappointed to learn that their situation cannot be remedied by this cost-effective option. If you are interested in cabinet resurfacing services, but are not sure if your home is an ideal candidate, be sure to contact us today! We’d be happy to provide a free in-home consultation to provide the best advice for how to affordably achieve your dream kitchen. Remember that cabinet refacing is just an update for your existing cabinets, and your floor plan will have to stay the same. Homeowners hoping to make major changes to their kitchens will find that the low cost of cabinet refinishing or resurfacing has now grown in size to account for structural updates. Fridge relocations, layout changes, and any other updates will require additional services, costing more than the initial budget. If you want to move your fridge or stove, it can help to find a remodeling company that has the custom cabinet solutions to help. Call us today to see how our services can be personalized to best fit your property needs. Much of the quality of your cabinet refacing project will depend on the original integrity of your existing cabinet boxes. Simply put, boxes that are ragged, worn, or otherwise broken will not be worth the cost and effort of refacing, as the return on your investment will likely not be worth the price tag. Cracked boxes and loose doors can both impact the aesthetics of your Georgia kitchen, and cabinet refacing will not be able to correct these problems. While cabinet refacing is intended for systems that are still in good shape, it doesn’t mean that you are doomed to pay for a complete replacement. Detail Design & Remodeling is here to enhance homes in Atlanta and the surrounding areas, delivering high-quality craftsmanship to deliver a smooth, seamless outcome for your kitchen. We can help you to implement cabinet repairs (when feasible) to prepare for quality refacing services. We are here to provide outstanding aesthetics for the fronts of your cabinets, but our services typically do not extend to the interiors. Homeowners with drab interiors can benefit from the beauty of real-wood veneers, yet opening a cabinet door may dispel the illusion of complete quality. Our home remodeling contractors are available to provide complete results, listening to your demands and goals to provide the best result for both your plans and your budget. We may suggest interior cabinet painting or new shelving, but keep in mind that this additional labor and resources will increase the price tag. Many homeowners find success in DIY cabinet painting in their box interiors. 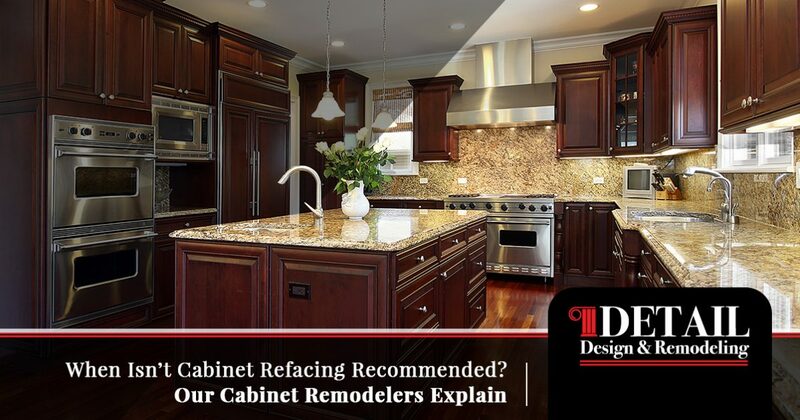 There are several limitations possible with cabinet refacing, but before you give up hope and begin designing your custom cabinets, remember that these challenges can often be overcome by an experienced renovation company. Detail Design & Remodeling is here to serve as your trusted home remodeling contractors across Georgia, providing unbeatable results that are sure to last. We are proud to deliver old-world craftsmanship on every project we set foot on, delivering comprehensive assistance to help customers find the best possible outcome for their unique projects. Our home remodeling contractors will take the time to come and visit with you in your home, learning about your goals and future plans for the kitchen. We’ll learn about your family and household dynamics to ensure the best fit. While we specialize in cabinet refacing for Atlanta homes, we can also deliver on all of your home remodeling needs. Contact us today to see if cabinet resurfacing is right for you!